Every effort is made to understand your unique needs, values and goals before recommending any financial strategies. The advice you receive is specifically designed to be suitable and appropriate based on your objectives. Our Professional Advisory Network provides you with creative strategies to your most pressing financial challenges. A customized Investment Plan is based on well-researched, academically sound investment strategies for you. We regularly and systematically monitor your investment portfolio. We encourage you to share your opinions, request explanations and express your preferences. In return, we are forthright and open in all our exchanges with you, our valued client. The process starts with a Mutual Discovery Meeting, where we will get to know each other. This is something that we take very seriously and leads to the development of our Total Client Profile. 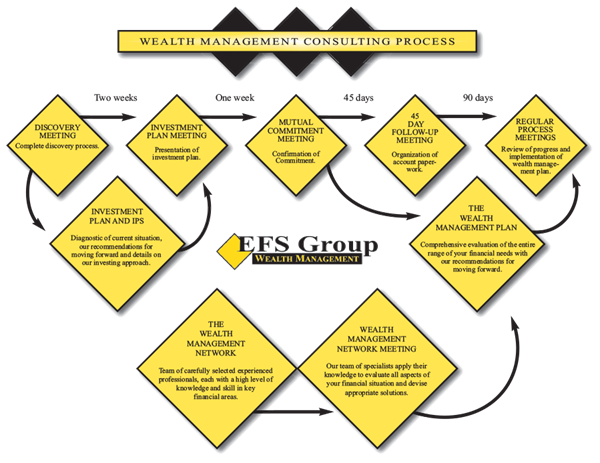 We then follow a systematic process designed to solve your most pressing financial problems. This may take some time, but we are resourceful and creative, and we will work to find the right strategy for you. Time frames are approximations and will vary based on your unique needs and the availability for scheduling appointments.